A few things visible inside the sports-themed Bellevue bar immediately signaled that this Stanley Cup playoffs opening night was different. For one, every television with a lone exception at the East Side branch of Henry’s Tavern was tuned to hockey. A nod was given to the Mariners on a smaller TV, but otherwise it was all pucks and body checks involving teams that don’t even play locally. Sure, we’ve come to expect this at The Angry Beaver bar in Greenwood over the years, but not in a prime Bellevue watering hole. Finding a hockey game on TV anywhere near Seattle but The Angry Beaver when local teams are playing other sports is about as commonplace as seeing the Mariners atop the MLB standings — making this spring the rarest of the rare. Sure, it helps that this particular playoff launch is the first since the city was awarded an NHL expansion franchise in December to start play in October 2021. The NHL Seattle group sponsored last week’s playoff opening-night event at Henry’s, offering free-drink coupons to the first 200 patrons and selling hockey-themed appetizers like a “Grinder Charcuterie Platter” and a “Buzzer Beater Trio” combo with tortilla chips. So, this was more of a staged happening than an organic gathering of puckheads collectively demanding TV sets be tuned to games played on ice. But nonetheless, the sight of Henry’s patrons donning Tampa Bay Lightning, Toronto Maple Leafs, New York Islanders, Calgary Flames and St. Louis Blues jerseys while cheering a flurry of late-game goals as day morphed into night had to feel surreal for any hockey fan living here a few years. Kim has plenty of experience with NHL anticipation, having secured trademark rights to the Seattle Metropolitans name and logo a few years back hoping hockey’s pending arrival would spur sales of merchandise themed with that 1917 Stanley Cup winning team. 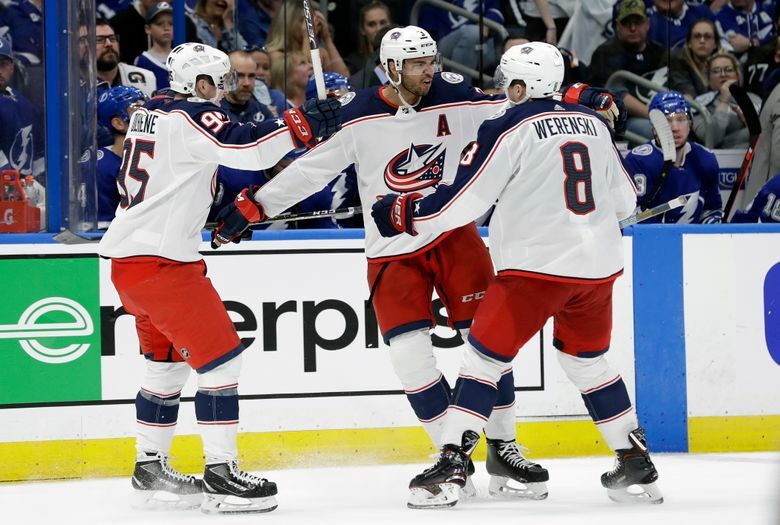 On this particular night, sporting one of his Metropolitans jerseys, Kim was in pure fan mode watching the Columbus Blue Jackets rally from 3-0 down for a 4-3 win over the Lightning while the Islanders beat Pittsburgh 3-2 in overtime. “A lot of people had no idea this was going to happen five years ago and it’s been pretty exciting with how fast it’s moving now,’’ Kim said. A precursor of things to come? The NHL Seattle group sure hopes so. They’ve got 2½ years to build a fan base and are using that time to change the habits and expectations surrounding this city’s sports scene. The level to which that tradition exists is still up for debate, judging by how rare a playoff hockey gathering still can be in these parts. As often mentioned the past decade, Seattle is a demographically changing city and the sports scene is evolving along with it. NHL Seattle ownership has made a $1.6 billion-plus gamble on a KeyArena refurbishment, NHL expansion franchise fee and Northgate Mall training center hoping this really is more of a hockey city than it lets on. Certainly, the mass influx of technology workers from places with NHL teams has fostered pent-up hockey demand, as witnessed by the 33,000 season-ticket deposits made in 31 hours last year. But more than a few out-of-towners have mentioned you’ll otherwise hardly ever actually see that hockey demand manifested in public. The infrequency of NHL games on TV here might be the only example ever of Seattle sports bars under-serving their patrons. Also, for a supposed hockey city, you can twist your radio dial until carpal tunnel syndrome kicks in without finding Stanley Cup playoff talk. We had a Frozen Four college national championship tournament going on and major junior hockey playoffs involving local teams that barely get more than passing attention over airwaves and in newspaper pages. Is that a true reflection of what local sports fans want? Henry’s seems to be banking on a changed landscape. This is the second event they’ve partnered with NHL Seattle on, the other being a watch party in South Lake Union last December when the expansion announcement happened. Indeed, it makes business sense for local bars to get in on hockey early if they figure it’s set to explode locally the way it did in Las Vegas. You’d have to think patrons watching the local NHL team on a wintry Tuesday night come 2021 will outdraw viewers of Big Sky Conference college football game replays that now pass for midweek bar TV content once baseball season ends. But it’s up to the NHL Seattle group, not this column space, to change that dynamic; to create an environment where hockey fans don’t feel sheepish asking bartenders to switch the TV channel from a far off college football or basketball game between two nameless schools nobody is really paying any attention to. We aren’t there yet as a hockey city. And in fairness, maybe we won’t be until after a pro team starts firing pucks in the city’s name and gives winter call-in listeners something to chat about other than whom the Seahawks should draft with their fifth-round pick. There’s room for some sports diversity in this changing town. And showing up for last week’s tavern event was just the start for local hockey fans if they want to claim a bigger piece of that action.